I’m diving into the Indie Pattern Month contest over at The Monthly Stitch. This weeks contest is all about separates. Hey, that’s what I do! This time though, I’m aiming to make them play nicely together. Let’s see. 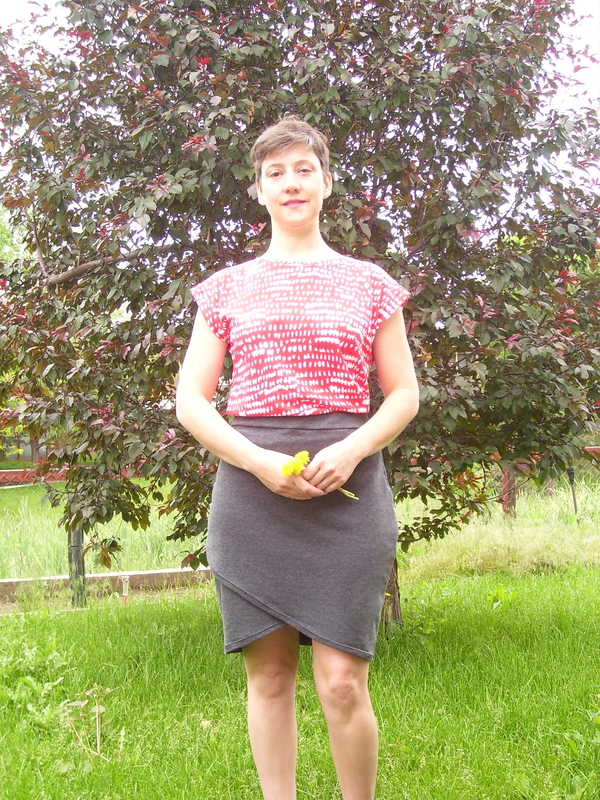 I’m putting together the Lindy Petal Skirt from Itch to Stitch in a size small (blogged here) and a new work up of a personal favorite, the Kirsten Kimono Tee from Maria Denmark with a small modification, in a size medium. The Lindy was made using a wonderful French terry in charcoal gray from Raspberry Creek, one of my Core Wardrobe colors. I made a size small and shortened the length by 1in. Next time, I may slim down the hip area to reduce some of the lumpiness there. The pattern is well put together, with easy instructions for making alterations. The Lindy is easy to make, a great stash buster at less than 1 yd (for me anyway), and looks so smart. For my second try at the Kirsten Kimono I sized up to a medium. (first version here). I like my summer tees a little looser, so this fit is better. For something a little different this time I wanted to add a 2in bottom band. I reduced the tee length by 4in when cutting as it was looking pretty long, and then added on the 2in band. The Kirsten Kimono pattern does not include seam allowances, argh, so I trace mine with 3/8in seam allowances for serged seams. The sleeve has a 1in hem allowance added and is sewn down with a stretch stitch. I used a light weight mystery knit for the Kirsten Kimono, a prize from Elizabeth Made This during Sew Mama Sew’s giveaway day. It’s a bolder color than I would normally choose but I’m so glad I got to try it out. I like the two pieces together, but tucking in the tee gives a little bit of lumpiness under the skirt. Untucked is fine, but only just fine. Take a look as I pair it with my Cobalt Shorts. I like these two together. You can check out what others are making for the contest over at The Monthly Stitch. Very cute! I am also newly in love the Kirsten kimono tee and I have an outfit made of the same 2 patterns…they obviously go well together! Thanks Helena. I thought I might be done with the Kirsten (I don’t repeat patterns too much), but its such a great fit for me. I’m thinking how to make a reversible version. I really think the skirt looks nice with the tucked in shirt. The overall silhouette is flattering. I can’t see the lumps in the photo. I agree, the untucked look generally doesn’t do much for me. This is such as wonderful combination. The blouse fabric is gorgeous. I found your blog through Sew Chic in a Week….